Definition at line 121 of file FormatString.h. Definition at line 123 of file FormatString.h. Definition at line 192 of file FormatString.h. Definition at line 196 of file FormatString.h. Definition at line 207 of file FormatString.h. Referenced by clang::analyze_printf::PrintfSpecifier::getArgType(), clang::analyze_scanf::ScanfSpecifier::getArgType(), and ParseScanfSpecifier(). Definition at line 203 of file FormatString.h. Definition at line 221 of file FormatString.h. Referenced by clang::analyze_scanf::ScanfSpecifier::getArgType(), isArithmeticArgumentPromotion(), and clang::analyze_format_string::ParseFormatStringHasSArg(). Definition at line 223 of file FormatString.h. Definition at line 669 of file FormatString.cpp. Definition at line 199 of file FormatString.h. Definition at line 231 of file FormatString.h. Definition at line 232 of file FormatString.h. Definition at line 228 of file FormatString.h. Definition at line 238 of file FormatString.h. Referenced by clang::analyze_printf::PrintfConversionSpecifier::classof(), and clang::analyze_scanf::ScanfConversionSpecifier::classof(). Definition at line 230 of file FormatString.h. Definition at line 226 of file FormatString.h. Referenced by ParseScanfSpecifier(), and ParseScanList(). Definition at line 222 of file FormatString.h. 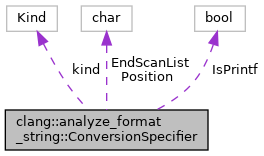 Definition at line 617 of file FormatString.cpp. Definition at line 245 of file FormatString.h. Definition at line 243 of file FormatString.h. Definition at line 246 of file FormatString.h. Definition at line 244 of file FormatString.h.